So, we were at American Girl today and Lainey was really needing to be nursed. She was way overstimulated and inconsolable. So, Sundi found a place with comfy chairs in a semi-private area. Well, this rude woman comes over to me and says, “You need to do that somewhere else. Try the fitting rooms,” and walked away. Well, I went downstairs to the fitting room and asked the woman there, “Can I nurse her here,” referring to my screaming-bloody-murder child at this point. She says, “I need to find out.” She comes back a few minutes later and says, “Go ahead, whatever.” She then continued to talk about me to another worker just outside the fitting room door I was in. This is totally unacceptable and as a nursing mother I’m personally offended by the ignorant employees at American Girl. Forty-Five states, including New York, have laws that specifically allow women to breastfeed in any public or private location. Nursing is a huge sacrifice and it’s difficult enough without additional societal pressures and people making you feel like you are doing something dirty or wrong. If this woman had sat down and started feeding her baby from a bottle no one would have glanced twice at her. I breastfeed Cole, and I’ll be the first to admit that nursing in public is uncomfortable. No matter how much I cover up there are still people who stare at you like you have ten heads. Does the world think that I enjoy pulling out my breasts in public? No! But I do it because it’s the healthiest and most natural way to nourish my baby. I’m proud of my choice and no one will make me feel ashamed for breastfeeding my child. When did breastfeeding, something that has taken place since the beginning of time, become so disturbing to people? And WHY? Normally my posts are much happier, but I had to share this woman’s story and my reaction to it because it’s an important subject. 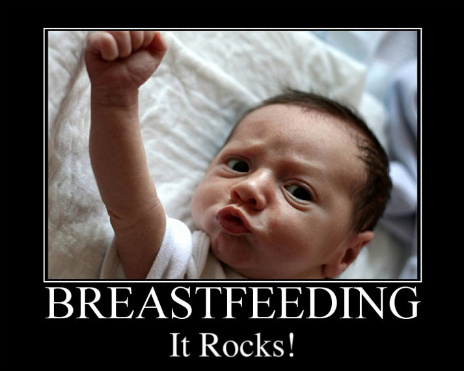 If breastfeeding continues to be widely unaccepted by the American public, less and less moms will nurse. And that’s truly a shame. There are so many benefits to nursing, both emotionally and physically, for mom and baby. I think that if it was more widely accepted then more people would at least try.